This natural science and fine arts museum is located on the shores of Lake Michigan. 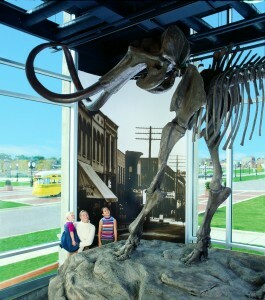 From primitive monsters of the deep waters, through the Ice Age, to the Native Americans in the fur trade era, the permanent exhibit tells the Wisconsin story, featuring a life-size replica of the Hebior mammoth. Changing exhibits include anything from nationally recognized watercolor paintings to original comic strip art. Be sure to stop by the Field Station for plenty of hands-on activities! The gift shop has gifts and souvenirs for the whole family.